Basic Red Curry Paste is different than Red Curry Paste that it has dried chili peppers, salt, galangal, lemongrass, kaffir lime zest, garlic, shallots and cilantro roots. The fragrance is from fresh spices as opposed to dried spices. Basic Red Curry Paste is used for making 'gang kua', a curry similar to red curries. It is also used as a building block for other curry pastes such as Red Curry Paste, prig king and panang. Basic Red Curry Paste is available in plastic tubs and cans at Asian markets and some mainstream supermarkets. You can store the Basic Red Curry Paste in a plastic bag in the freezer for a year. See recipe for homemade Basic Red Curry Paste and homemade Red Curry Paste. 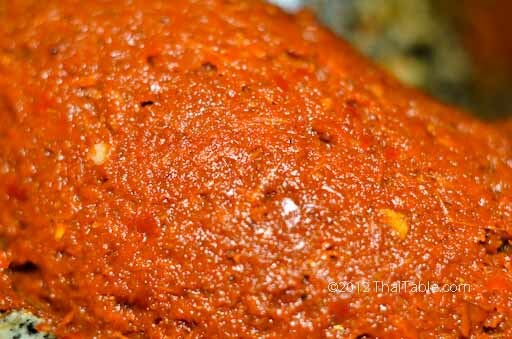 Check out in details how Red Curry Paste is different than Basic Red Curry Paste.